Belfast residents Rick Cronin, left, and Mike Hurley, right, smiled Easter Sunday with Wally the Green Monster, a 1,500 pound fiberglass bobblehead figure that they were installing at Fenway Park in Boston. Wally is the official Red Sox mascot and is going to be featured in Fenway's new Kids Concourse. Mike Hurley, the Belfast-based owner of Fiberglass Farm, paused to snap a photo of the Wally the Green Monster bobblehead after he crossed into Massachusetts on the way to Fenway Park in Boston. Hurley's company was hired to create the 1,500-pound fiberglass figure for the baseball stadium. 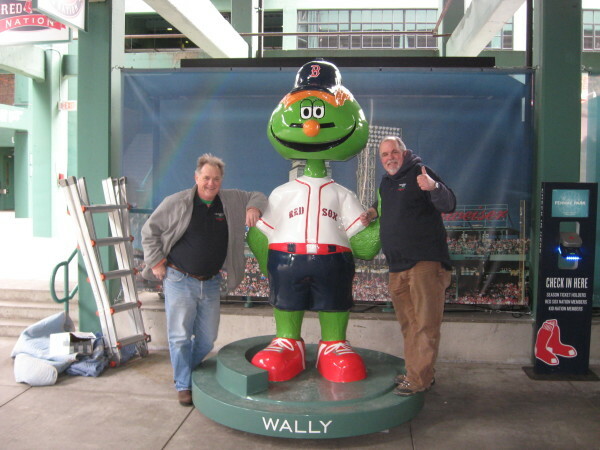 BELFAST, Maine — Belfast entrepreneur Mike Hurley recently helped bring a giant bobblehead of Wally the Green Monster, the official mascot of the Boston Red Sox, to Fenway Park. Along the way he got a refresher course in the power of Red Sox Nation. As Hurley turned east onto the Mass Pike on Easter weekend with the fiberglass figure securely strapped to a trailer pulled behind his pickup truck, other drivers knew exactly what they were looking at — even though Wally’s head was detached for safekeeping. Hurley, well-known around Belfast as a longtime city councilor and co-owner of the Colonial Theatre, owns several other small businesses, including Fiberglass Farm. That business came about after Belfast started holding its Bear Fest in the early 2000s, a street art festival that featured painted fiberglass bears. It was successful, and Hurley began to get phone calls from officials in other cities saying that they wanted to do it, too. “The fiberglass industry had not adjusted to this demand for 50 things at a time,” he said. So Hurley found fiberglass artists who could make the bears, cats, dogs, cows, horses, ducks, eggs, dinosaurs, birds and other desired shapes. Through Fiberglass Farm, he takes orders and delivers finished products to communities and organizations. He said he has sold “literally tens of thousands” of the creations over the years. It opened another door, too. Over the years, Hurley has been getting phone calls from people who want something more unique to put on display at their stadiums and other places. Among those he’s responsible for are the world’s largest longhorn steer for the University of Texas in Austin and a big bobblehead figure of Tommy Lasorda for Dodger Stadium in Los Angeles. “Over the years, I’ve basically developed a network of artists and shops I work with around the country that have the ability to do this sort of thing,” Hurley said. A few years ago, he got a call from someone looking to place five giant bobblehead figures at Oriole Park at Camden Yards. Earlier this year, he got a call that thrilled him. The Red Sox wanted a 6-foot-9-inch Wally bobblehead for their new Kids Concourse. “I was very excited to be getting a call from Fenway,” Hurley said. Earlier this month, Wally was ready to be picked up — all 1,500 pounds of him. Hurley drove 3,000 miles to pick him up from the designer in the Midwest, and brought him to Fenway on Easter Sunday. There, he met his friend and fellow baseball fan Rick Cronin of Belfast, who helped him install the figure.